Welcome to Uptown Auto Repair, your one stop headquarters for all your automotive repair, service and maintenance needs. We have been your neighborhood automotive shop that people have relied on for top notch workmanship, friendly honest service and quality name brand products, for over 15 years. If you need an oil change, tires, wheel alignment, repair or any service for your car give us a try. You will be 100% satisfied with our work and delighted with the price. We guarantee it. 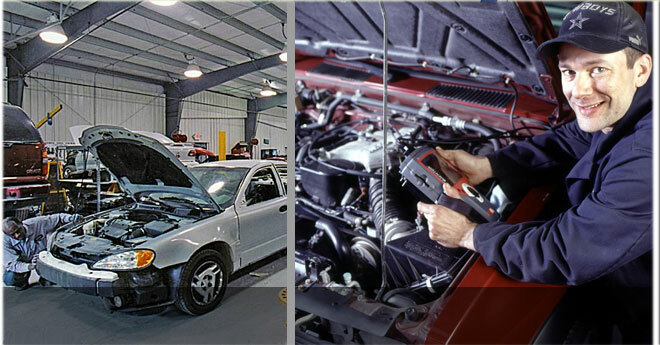 We provide full service, maintenance and repair for any vehicle. We are a full service motor vehicle shop performing all mechanical and electrical repairs to any year, make and model of vehicle. We have the latest in high tech diagnostics to pinpoint any problem so it gets handled fast and you are back on the road quickly. We understand how important your vehicle is to you and strive to keep it in the best possible working order. Oil change and lube. We use only the best grades of oil and lubricants. Bridgestone, Goodyear, Dunlop and Michelin. Mufflers. We provide complete exhaust systems from the manifold to the tail pipe. Auto Glass. Chipped window? Broken window? We will take care of it. These are just a few of the many areas of automotive service that we provide. It does not end there. We have the technicians and technology to handle any automotive situation that comes our way and we will do it better than anyone. Our staff holds your satisfaction as their ultimate goal. We have maintained the philosophy that repeat customers bring more customers since we opened in 1993 and we still hold tight to that belief today. We provide full service auto repair and maintenance for the entire borough of Manhattan and the surrounding areas.